The Samsung Galaxy Fold has an official UK price and release date: the all-new folding smartphone will be available from £1,799 in the UK next month from Samsung's online retail store and high street Experience Stores, as well as via an exclusive operator partnership with EE. Pre-orders for phone will go live on Samsung.com/uk/Galaxy-Fold and ee.co.uk/samsungfold from Friday April 26 ahead of the first foldables appearing on shelves nationwide on Friday May 3, 2019. You can register your interest with Samsung and EE from today. Speaking about the newly-announced UK pricing, which was absent when Samsung revealed the folding phone for the first during the Galaxy S10 launch event last month, Samsung Corporate Vice President Conor Pierce said: "Samsung is delighted to be partnering with EE to bring the incredible new Galaxy Fold to the UK market. "With the Galaxy Fold, we didn’t just change the shape of the phone. We pushed the boundaries of innovation to change the shape of tomorrow. 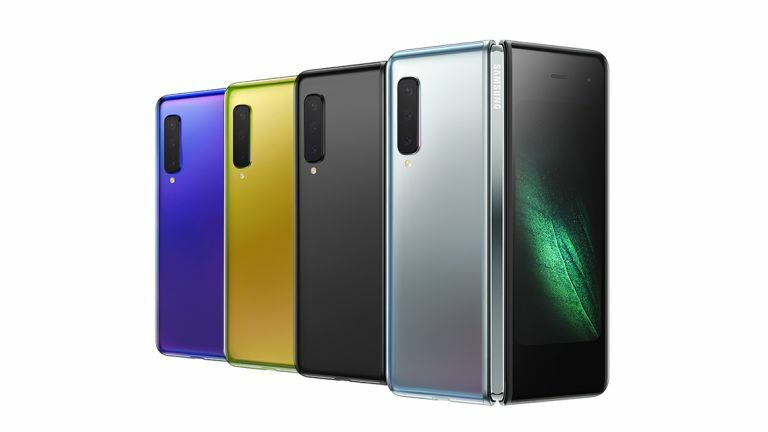 We're a decade on from when we launched the first S Series phone; the aspirational design of the new Galaxy Fold will help define the next ten." All Samsung Galaxy Folds will ship with Galaxy Buds and a slim-design protective Kevlar case. EE price plans will be announced at a later date.